This is a very personal pattern, in the sense that it was designed specifically for Willow, and with specifics in mind. Maile is a fragrant vine endemic to Hawaii, and it is traditionally used as a kind of very special lei; Dave and I wore maile leis on our wedding day. The lei is traditionally worn open, draped over the shoulders, and the leaf pattern in this sweater echoes that. So this pattern probably won't speak to most people the way it does to me and Willow, but it's pretty, and I thought I'd share it. Size: 3 months, 20-in chest circumference. (I know. It would be nice if I provided multiple sizes. But I find baby sizes to be completely insane--Willow currently fits "newborn" and "3 months," but not "0-3 months." She fits this sweater. She is two months old. I leave it to you to determine. Also, raglans are pretty easy for mucking around with the sizing). Rows 5 & 7: As row 1. Charts courtesy of Sarah Missingham at SilkyDoll--thank you Sarah!! Row 1: (k1, yo)2X, sl-k2tog-psso, k3, k3tog, (yo, k1)2X. Charts courtesy of Sarah Missingham at SilkyDoll--thank you, Sarah!! K5, work Lace Pattern #1 to last 5 sts, k5. Repeat the last two rows until Lace Pattern #1 has been completed. Repeat the last 8 rows 2X more, then work even until piece measures 4.5 inches, ending in a WS row. Place these stitches on a holder, leaving the markers in place. Work 3 rows in stockinette. Repeat the last 4 rows 3X more. Work 5 rows in stockinette. Work even until piece measures 4.75 inches, ending in a WS row. Place body stitches back on needles. K to 8 sts before marker, ssk, pm, k6, remove m. K7 sts from 1st sleeve, pm, k2tog. K to 3 sts before end of sleeve, ssk, pm, k to end of sleeve. K 1 stitch from back, k2tog, k to 3 sts before marker, ssk, pm, k1, k 1 st from second sleeve, k2tog, k to 9 sts before end of sleeve, ssk, pm, k to end of sleeve. K 6 sts from left front, pm, k2tog, k to end. Note: Yes, this is exceedingly hard on your hands and needles, and it would be so much easier if I'd bound off sts to be sewn up. But I don't like the way that feels under my arms, so I prefer to struggle through. Feel free to bind off a few sts on either side of the sleeves and at the markers in the body to free up some space for yourself. K to 2 sts before m, ssk, work Lace Pattern #2 between markers, k2tog, (k to 3 sts before m, ssk, k2, k2tog)2X, k to 2 sts before m, ssk, work Lace Pattern #2 between markers, k2tog, k to end. Repeat the last two rows until there are 83 sts on the needles, working a buttonhole row every 10 rows. K 1 row, decreasing 6 sts evenly spaced. Repeat the last two rows 4X more (53 sts). It's really a wonderful pattern! I love the color as well. What a cute little thing! Her personality really shows through in the pictures. She's growing too quickly! The pattern, the sweater, the baby, the story - all just utterly charming! Lovely sweater, lovely baby! You're a woman of many talents! That last picture of Willow is so cute! Her expression appears to say, " OK, you get one more little smile from me today, but after this, all bets are off!" Thanks again for the pattern! I want one in my size! thankyou so much for sharing the pattern so generously. My little girl is just a month old. I hope I can find time to make her this sweater. The sweater and the child are both beautiful! Beautiful sweater and a gorgeous baby. Thank you for sharing. What a gorgeous pattern. I love the meaning behind this. I just clicked over from WhipUp and I'm so glad I did. I would love to link to some of your projects if you didn't mind. I have started to knit one of these super cute sweaters. Just a question with the first lace pattern. Am I suppose to knit a Row 2 (k5, purl to last 5st,k5) in between the lace pattern rows in alternate? Because I have done 6 rows of the lace pattern so far and I have a garter stich row in between the pattern which I can't see from your pictures. Looking forward to hearing from you. Yes, you're supposed to knit Row 2 as the even rows--only the bottom cuff is in garter. Willow is an absolutely beautiful baby. Good work on her lovely sweater. very very nice! thanks a lot for the pattern! This is a lovely sweater. Willow is so precious, I'm sending her a hug right now. What a beautiful baby, sweater and story! Thanks for sharing. Congratulations to you and your husband, Willow is such an adorable baby. Adorable sweater (and baby). It will probably be my next baby sweater. I apprecaited your story of the pattern creation--it's always nice to know what's going on in the designer's mind. Love this pattern! Thank you! I´ll be a grandmother this autumn and will knit it for my son and his girlfriens baby. I love this pattern. I save it for my grandchildren i future. Thank you! I wandered on to your blog and have been reading, browsing, reading, browsing and reading some more. Your daughters are beautiful. I could just sprinkle on some sugar and eat Willow right up. I mean that in the nicest way. You've done a beautiful job with this sweater mimicing the lei. Thank you for your selflessness in sharing the pattern. I've several girlfriends expecting and I just know they will adore this sweater. They all just happen to be expecting girls. I hope you are enjoying the tropical delightful surroundings of Hawaii. It has always been one of my favorite places having been blessed to spend the summer months and Christmas's of my childhood through college living there. My husband and I honeymooned for a month in Hawaii and we continue to travel back. It really is paradise. How blessed you are to be able to enjoy it with your children. One day I hope to do the same. I am a new knitter and I am making this as my first cardi project and I need help. It means (K to 3 sts before m, ssk, k2, k2tog)2X, k to end, then knit seven rows in plain stockinette, which makes eight rows total. Then you do that whole thing again--the decreases, and then the seven rows in plain stockinette again, which makes sixteen rows total. And then you do it all one last time, making it 24 rows total. Does that make sense? I am loving knitting your little cardigan. Some of your abbreviations are different to the ones used here in Australia so can you please tell me what 'pm' means? Does it mean 'place marker' . Hi Wendy--it does mean "place marker." Enjoy! Very nice sweater ond baby!! But what do skp in the lace pattern means? Hi Nikki, I love this pattern and am working on it right now. I've never knit a raglan sleeve and am having trouble making sense of pattern after you knit the first buttonhole row. I'm sure I'm reading it wrong... but when you get the first marker, do I only knit the lace #2 pattern once between the 2 markers, twice, or more until I hit the 2nd marker?? I decided to knit the lace #2 pattern until I hit the 2nd marker, but the number of sts didn't end up working out at all... arg. (I counted 38sts between the 2 markers, by the way). SO I'm assuming that I'm doing something wrong! Any help or clarification would be SO appreciated!! :) Thanks in advance! I love your patterns. You need to place a few more markers. Go back to the paragraph where you start working on the yoke--you place a few more markers there (it's easy to skip--"pm" seems like such an innocuous instruction) and so there are only 15 stitches that you're working lace pattern number two across. Oh ok! Wow, thank you SO much for responding so quickly. I really appreciate it!! I will go fix my error and get back to knitting up this adorable sweater. :) Thanks again! do you knit the sleeves in the round? or flat? The pattern indicates that the sleeves be knit flat, but they certainly could be knit in the round. Yoke instructions say PM k6....k7 from sleeve PM... that makes 13 stitches for lace pattern # 2. I am counting 17 for row one, you say 15 stitches in an earlier post... maybe it's the sl k2tog psso that is messing me up... I am counting that as 3 stitches...slip one. k2tog, then pass the slipped stitch over? I appreciate any help you may have to offer. This may be the nicest thing i have ever made, if i can only work this part out! The stitch count changes over the course of lace pattern #2, but it starts out as thirteen stitches--I'm not sure how you're counting it, but my count is thirteen. I would just start knitting if I were you--it should work out. Totally love the look of this pattern but what do you mean with the abbreviation skp in the lace#1? "SKP" means slip-knit-pass. You slip the first stitch, knit the second, and then pass the slipped stitch over the knit stitch--decreasing one stitch. Thank you for the clarification. This is such a beautiful sweater! Hi There! I am loving your pattern but I have lost my way a little! I am just about to start the first row of lace patter #2 ( a bit like the lady above) but I have lost a couple of stitch markers!! I wondered if you could let me know what the stitch count and marker placement is?? I hope you can help? Thank you again for a fab pattern! Hi--I'm not sure what the stitch count is, but if you go back, it should be clear where you joined the sleeves, and the markers are placed around the sleeve join. When knitting the yoke and it says to 'Repeat the last two rows until there are 83 sts on the needles, working a buttonhole row every 10 rows' - which two rows are you talking about? I'm sure its quite simple, but I keep messing it up! I did the last two rows of Lace Pattern 2 and it was obv. wrong, so I took that out, thinking to do LP2 2x more, but the stitches dont fit, so either I left out some when pulling the work out, or I'm just doing it wrong! Love this sweater, hoping to get my little 3 week bean in it soon!! Row 1: K to 2 sts before m, ssk, work Lace Pattern #2 between markers, k2tog, (k to 3 sts before m, ssk, k2, k2tog)2X, k to 2 sts before m, ssk, work Lace Pattern #2 between markers, k2tog, k to end. Sorry not to be more helpful! THANK YOU SO MUCH!! For a lovely pattern and the help along the way! Will be putting photos up on my blog and Ravelry very soon - I hope I have done it justice for you! Hi,I'm working away on this gorgeous cardi of yours but have come to a grinding halt! When you say "work these two rows until you have 83 stitches" I don't know what you mean.You answer this question in another comment but the first row ( of the two) you mention comprises of ten rows of lace pattern #2 which means I cant be decreasing ?? What am I missing? Am I only supposed to continue with row 9 of the lace pattern then a purl row? Sorry but it didnt make sense to me.Thanks for the help! Nope, you work whatever row of Lace Pattern #2 is next, but you're decreasing around that lace section--it stays between stitch markers. I just finished one in bleu - minus the lace pattern at the bottom, we don't know yet if we are having a boy or a girl -, and with a different gauge to get a size 12 months. Oh my, that's beautiful! I'm a Hawaiian living in northern Illinois, and I absolutely must knit this pattern!!! This is the most beautiful baby sweater that I've come across. I definitely will make this one, thank you so much for sharing. My newborn great-niece will be wearing this at her mother's wedding. Thank you for sharing this pattern and allowing it to be such a special part of our lives too. Pics on Ravelry soon! I saw this sweater in pink on a bulletin board in my LYS today and had to have it. And, of corse, some nice tonal green Shibui. Thank you so much for sharing your talent. ...Could you please lemme know what the 2x would mean and the rest of the instructions? The 2X means two times--so work everything in bold below two more times. Work even means to work in stockinette stitch for 4.5 inches, ending with a purl (WS--wrong side) row. Hi, I've been working on this and am a little confused by the measuring. In the sleeves you say, after working all of the initial rows that I should continue even until the piece measures 4.75 inches, but the piece already measures about 6 inches after I finish the initial rows. Have I done something wrong? thanks a lot nikki. i am now doing the sleeves...at the end...should i place them on holders too? i am done with 1st sleeve and have to start the 2nd. ohh i forgot, i actually cut off the yarn after the body stitches were placed on holders...i hope that isnt wrong! Can u pls let me know how i shud start knitting the sleeve after he marker on the body?? Also when do i stitch the sleeve sides? I'm not sure how to describe it any more clearly than how it is written in the pattern, or has been discussed in the comments previously. I would suggest simply starting on the yoke and following the instructions as closely as you can--it's simple enough once you get started; the issue is with the tightness of the needles--many people slip the sleeve stitches onto two dpns to give them some ease. As the pattern states, you sew up the sleeves after finishing the yoke. I used your pattern to knit "coming home outfits" for my twin girls last fall. It was very meaningful to me as well because my husband and I were married in Hawaii and wore maile leis. I want to thank you for sharing this pattern. The sweaters will be a treasured item to save for them. I'm having trouble adding the sleeves, I followed the pattern, but after I added the first sleeve, my needles were too tight to keep knitting. I know you said you can bind off some stitches to give more room, but if I do that, how do I continue with the pattern? Thanks for your help! Well, you'll need to rip back a bit. You would need to BO stitches at each end of the sleeves (just 2 or 3 on each side), and then BO either 4 or 6 stitches at the sleeve join in the body. I'm sure that sounds tricky--if it were me, I would stick with what you have. I'd slide some of your sleeve stitches onto a couple of dpns, which will give you some room to work with. So far I am loving this pattern but I am a bit confused. **last row of lace pattern is purling all the stitches-well expect the 5 first and last st. The purl stitches are always on the wrong side--that should clarify things! So the place marker row is a Right Side row. I am going to ML the sleeve on rather then knitting 2 and grafting them on so I wanted to double check about st counts--there are 46st for the sleeves or is it far less when you attach them? Thanks for the lovely pattern! It's 46 stitches for magic loop, Rachel, so you should be fine. You seam the sleeves at the very end--they are written to be knit flat. Really stupid question--when you start the yoke, are the sleeves on the needles with it -- sleeve, yoke, sleeve. Or, are the sleeves on separate needles, and you knit them on from those? The sleeves are on separate needles, and then you knit them onto the long circular needle. Great. That's what I thought. Thanks! sceinThis is a beautiful sweater however I am having a lot of difficulty with the pattern. I've been working on it for months now and have knit and re-knit it again and again but I cannot get the lace to look how it does it the pictures. I have followed the instructions exactly and am sure that I have done everything right and yet only half of the lace pattern works. The left side just does not look right. I plan to continue because it still looks alright but I'm wondering if anyone has finished this sweater looking exactly like it is supposed to? Is it just me or is there something wrong with the pattern? I am very anxious to get at this pattern but have already hit a road block. I am fairly new to this type of knitting so please excute my lack of knowledge. When the Lace Pattern #1 is worked it states: K5, work Lace Pattern #1to last 5 sts,K5. If I follow what it says I don't have enough stitch. What I tired to knit was K5,k3, k2tog, yo, k1, yo, skp, *k5, k2tog, yo, k1, yo, skp; Repeat from * to last 3 sts, k3,k5. Also, for row 3 of the same lace pattern would there also be K5 at the beginning and end of the row? I'd really appreciate your help. For the Lace Pattern #1 - for Row 2 and all even it says to purl. Should the first and last 5 stitches be knit? Love the pattern and hope I can get it complete before the baby shower. I'm not sure where your trouble is--perhaps you didn't cast on the right number of stitches? Because if you're repeating from the * (not from the beginning of the lace pattern instructions) then you should end up with the right number of stitches. Yes, you do knit the 5 edge stitches on either side, throughout the sweater. Or is it just (K5, p to last 5 sts, k5) for those 7 rows? Thank you for sharing such a beautiful and personal pattern. I have knitted it twice so far, both in red and I plan on using it again soon. Alright, I'm having an issue with Lace Pattern #1. After doing Row #1, I ended up with 11 sts. and after Row #3, I ended up with 6 sts. Trust me, I've ripped it all out, started from square one and counted sts. until I'm cross-eyed. Is there a common misstep I'm making here? Just wondering. Awesome sweater, just my obsession right now! I don't know what's going on, but it sounds to me like you're having a mental block...and here's what I'd do: skip it. Knit that bit in stockinette--a lot of knitters prefer it that way anyway, I've noticed. Just go around the problem rather than trying force your way through it. Otherwise...make sure you're doing all your yarnovers! Hello! Just a quick question b/c a forum on Ravelry kind of confused me! Does "(K to 3 sts before m, ssk, k2, k2tog)2X" mean to work the sequence in parentheses two times, then knit the rest of the row? That's how I initally understood it. Just need clarification. Thanks! Thanks for the quick response! Now back to knitting this adorable sweater! Beautiful sweater....but the story behind it is much more beautiful. Making my second of these gorgeous cardis. The first was in a very pretty lilac and the second is in a light green for a little girl who's very likely to have pretty red hair. Beautiful sweater! Can you please tell me what SSK means? (ssk, k2, k2tog). Thank you. SSK is slip, slip, knit--you slip two stitches onto your right hand needle, and then insert your left needle into the back of those stiches, and knit them together. There are good tutorials online--just do a google search. Love the pattern but there are obviously differences between English and American patterns ! Would you please tell me what "skp" means. SKP is slip-knit-pass. You slip the next stitch on the left needle to your right hand needle. Then knit the next stitch, and pass the slipped stitch over the knit stitch--one stitch decreased. wanted to say i love your sweater, so much so i have started one myself. However, i am confused at the lace 1 pattern. it says to repeat to last 2 rows until lace pattern is complete. Am I correct at knitting k5, p to last 5, k5 and then the next row I k5, work in lace pattern to last 5, k5? The trouble I run into is with the row2 and even rows of the lace pattern. if i continue to repeat the two rows above and incorprate row 2 ans even rows together i end up with a garter stitch. Can you tell me what I am doing wrong? Sorry if that sounds oonfusing. This is my first attempt at a lace sweater. The trouble I run into is with the row2 and even rows of the lace pattern. if i continue to repeat the two rows above and incorporate row 2 ans even rows together i end up with a garter stitch. Can you tell me what I am doing wrong? Row 2 and all even numbered rows are straight up purled--so on your wrong side, purl across (keeping the 5 garter edge stitches, of course). That should keep it in stockinette, not garter. I just joined the sleeves to start the yoke, but it seems that i have a stitch count problem. There is a difference of 2 stiches in the sleeves stich count between the lace markers and the back markers. One of my back marker is located in the sleeve and the other one is in the back part so the back rAgalans are not quite centered. Shouldn't these markers be placed at the sleeves joints? Is this normal or did I do something wrong? That is definitely not normal! I think you may have misplaced the markers. In this first row the decreases are centered to the sleeve joints, and are centered to the back. After this row the decreases are no more centered to the joint and one of the sleeve has 2 sts less than the other one. Could you please explain me what I'm doing wrong? Thank you in advance. Well, it seems like you aren't working the lace pattern between your markers? Or are you working them in both the back and the front? They are only supposed to be in the front. It works like this: k left front, ssk, lace pattern #2, k2tog, k to end of sleeve, ssk, k2, k2tog, k to end of back, ssk, k2, k2tog, k to end of sleeve, ssk, lace pattern #2, k2tog, k right front. The raglan decreases are broken up by the lace pattern in front, but not in back, which can make it feel off-centered. It isn't--The stitch counts are evenly broken up, it's just that the division between the raglan decreases is larger in front than in back, if that makes sense. I hope this helps!--it is hard for me to correct something I can't see. Perhaps try bringing the pattern into your lys? Thanks for the informations, but I only knit the lace parts within the front raglans, ans what I called "joint" is only the place where the sleeves joined the back part. So the marker has moved from one stitch resulting to the uneven count number in my sleeves stiches count. will result in stitch counts evenly broken up and centered raglans. Markers will remain placed like this within the raglans: SSK-marker-K1-K1-K2Tog. I hope this make sense and I apologize for my english (I'm French). Tanks for your patience and for sharing with us a so nice pattern! As I've knit it up it works out fine--the instructions specify spacing the decreases away from the marker, not right at the joint as you specify--but if it's not working out for you, absolutely change it! After some researches on Ravelry, it appears that several people experienced the same problem. I think that the solution proposed by Kirsten1 on her comments to change the 3rd marker placement to straight after “K1 stitch from back” is the good one. It is symetric and the decreases are away from the joint. I made this for my youngest granddaughter a few months ago. It is a beautiful pattern. I'd like to knit a similar one with the same yarn for her 3 yr old big sister. Do you know of a pattern I can use? Thanks! Hello ! Thank you for this pattern, I have translated it into french, I can send you the french version (or post it on ravlery) if you want. I wish I could tell you that it's not supposed to stretch like that, but in fact, it is--that's the "painful" I referred to. You're doing everything exactly right, and it will work itself out, but though this feels wrong, it is right. Thanks for the quick reply, Nikki. I am persevering! Secondly, I presume that 2x means that after you complete the stuff in the brackets, you knit to 3 stitches before the next marker (ie. the 2nd marker) and do it all again? This would not be symmetrical though, would it?? I'm at the same point as Carmillia and am hoping someone could please explain what you mean by (K to 3 sts before m, ssk, k2, k2tog)2X, k to end. Am I to move the marker ? You slip the marker to keep working, that's all--ssk, k1, slip marker, k1, k2tog. Thanks for the clarification. Like Georgina, I just wanted to be 100% sure before ruining it and having to undo all my work. But I guess it was kind of obvious and sometimes you have to go with your gut feeling and just go with it. Love the pattern! Perfect for this Chicago weather we have been having. I am just about to finish it in time for my niece... I am not quite sure about the instructions at the end : K1 row, decreasing 6 sts evenly spaced. Can you break it down for me? I am not quite sure if you mean decrease 3 sts at each end to make it 6 sts total. Thanks! I didn't specify because it doesn't need to be perfect--k 5 sts, decrease, k6 sts decrease, k 4 sts, decrease, etc until you've done 6 decreases, and then k to the end. They certainly could be knit in the round, but as the pattern is written, the sleeves are sewn up afterward. When you say until piece messures 4,5 inches, what do you mean, is this messure from beginning? When I had finished this body decreace for third time my piece messured 5 inches already. Should I then stop knitting the body and have it 5 inches and begin on the sleeves? If your row gauge is longer than mine, don't worry about it--just follow the pattern and do all the body decreases; the sweater may hang down a little farther on the hips, but it'll fit better in the long run. That's much, much longer than mine--what is your row gauge? I think you must have repeated the pattern a few too many times--that's five times my length! Sorry! I actually meant the actual circumference length! It just seems very wide ; having said that I'm not too sure what size babies are as this is my first! Oh, that makes much more sense! And no, you're right where you're supposed to be--26 inches is perfect! It would make it easier to hook body and sleeves togethe if you specified a circular needle with a rather long cable ( perhaps 32" or even more?). You could then indicate that the painful tightness could be overcome with "magical loop" knitting. having just a short circular i managed by shuffling portions of my stitcheds onto dpns . Your instructions were perfectly clear ( though you forgot to tell us to remove the second side-seam marker) and i enjoyed the challenge of lace knitting inside the two raglan lines. A charming cardigan! Thank you. Thanks for sharing your talents with us! I am confused...when I place stitches on the holder, Do I cut the yarn in order to start the next part? I want to join the rest of the posters here and truly thank you for sharing this pattern. It is really beautiful and your a talented designer! I have a question as I'm about to begin LP2 and I have read through all of the previous posts and can't seem to find the answer. Your pattern says in the yoke section "work lace pattern #2 between markers", but if you count the number of stitches you start with between the first two markers (after doing the first bitton hole row) you only have 13 stitches to work with between these markers. 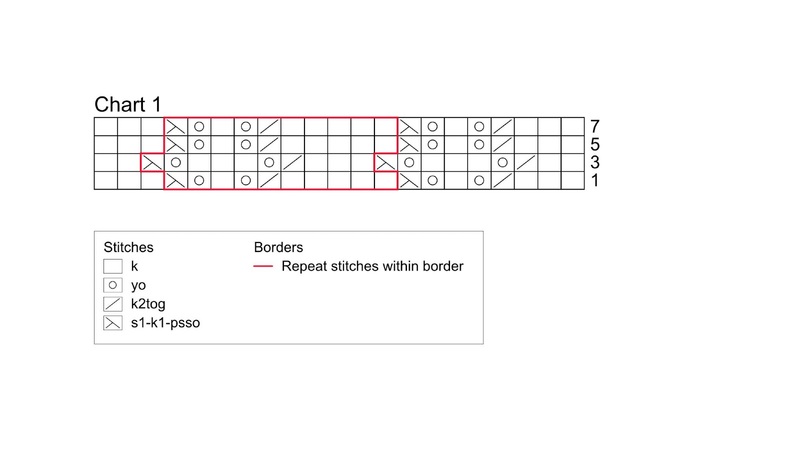 In counting the row 1 of LP2, it requires 17 stitches. 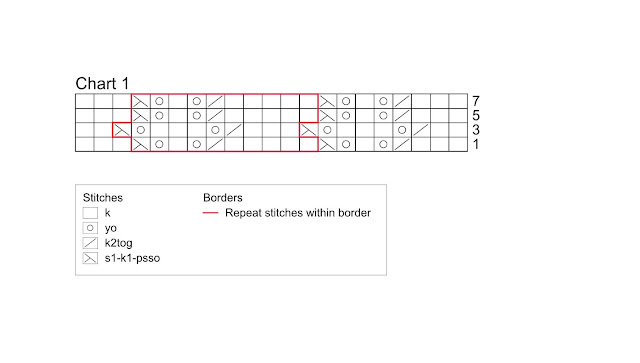 So should I go beyond the second marker to do all the stitches i need? Actually, I think you've miscounted--there are indeed 13 stitches between the markers, but Row 1 of LP2 only requires 13 stitches (Row 3 increases to 15 stitches, but Row 5 brings it back down to 13). I think if you knit it out, it'll work for you--sometimes it's hard seeing how a pattern will work when you don't have your needles in front of you. I'm so glad you like the pattern! Enjoy! Thanks so much for your super quick response!!! I've tried knitting it out and I'm still finding that my brain's not wrapping around it. I'm going to type out my crazy brain's interpretation of it and if you could point out my where I've gone wrong, that would be great!!! Thanks again! Thanks for all of your help, sorry to be a pain! (k1, yo)2X = 2 stitches. (The yarnovers don't use stitches, they create a two ones). Sl-k2tog-psso = 3 sts (This decreases two stitches, thus equalizing the stitch count). (yo, k1)2X = 2 stitches. I think if you knit it, you'll see that all this works out perfectly. Thank you so much for your help. Turns out that I was misunderstanding how yo stitches work. After your help and some YouTube research, I'm back on track. The LP2 is turning out beautifully. Thanks again for all of your help and this beautiful pattern! I bought your beautiful book and love making this sweater for my first grandchild. Could you please clarify for the sleeve, when you say to" k2, m1, k to last 2 st, m1, k2" - is that m1 right or left or ? I personally haven't found that slanted increases make much of a difference one way or another, so I just increase--I put a twist in it so it doesn't make a hole, but there's no need to worry about which way it's pointing. Of course, if you want to put slants in, please go right ahead! I've finished knitting the cardigan and it's absolutely lovely - thank you for the pattern. Lovely pattern and I hope the above might help anyone who was getting into as much of a mess as I was! Thank you so much, and I'm so sorry you had trouble--however, the way you have it here is actually incorrect; it places the lace pattern in the wrong spot. I don't think it'll be much of a problem for your finished sweater, but it isn't how the sweater was designed, and the way it reads currently is actually correct. We start from down with circular needle right? But it turns or stockinette stitch when we just knit. On the picture the edges are garter stitches? This is worked from the bottom up, and flat, and the edges are in garter. Repeat the last 8 rows 2X more, then work even until piece measures 4.5 inches, ending in a WS row." Does this mean until the entire length of the piece is 4.5 inches long, or to knit for 4.5 MORE inches? Not to worry--you only knit until the entire piece is 4.5 inches long. If you've passed that already, your row gauge could be slightly off, but that isn't a big deal--the sweater might hang a little lower on the hips. Thanks for the pattern and for all the help you provide. I would like to knit this in a larger size with a 5.5/in. gauge to achieve a 12 month size, but I have never dickered with a raglan sleeve before. Can you offer any guidance, or am I playing with fire? Raglans are pretty easy to mess with. If you up the gauge, make sure you get the proper chest circumference, and then the easiest thing to do is just work the raglan decreases until the neckline looks basically right. There are more complicated ways of doing it, but if you're making it for a specific baby that should be fine. I love this pattern, but I'm also having a problem with the length instructions. My gauge is right on - 9 rows to the inch, so for the sleeves, I've worked from the initial knit 10 rows, through the 4 sets of the 4-row stockinette section and 3 sets of the 6-row stockinette section - total of 44 rows so far. With the 9 rows per inch, that's already about 5 inches. If I finish the next set of 6 rows, I'm at 50 rows which with the gauge = 5.55 inches, but instructions say work even until 4.75 inches. Should I be measuring just from the start of the stockinette rows or should I have stopped when the sleeve length was 4.75 inches from the cast on stitches? I have the same problem with the sweater body. I would appreciate clarification. Thanks! Several knitters have had this issue, and honestly it's up to you--you can either stop knitting earlier to achieve the correct length (just make sure your stitch count is right, so decrease a few rows early), or you can knit the correct number of rows and have the body be a little longer, and the sleeves too. Really, it'll fit the baby eventually--they grow so fast! Hi! So, this is not a top down knit, right? I think I'll try turning it into one. And what's the weight of the yarn? Are you using DK? The design is bottom up--if you want to try it top down, be aware that the leaves will be upside down! The yarn is a sock weight. when it says repeat last 2 rows, i repeat rows 7 and 8? Hi, I am hoping to make this beautiful sweater. I love the colour and the pattern! I'm just wondering whether there is a particular needle length that is recommended? Thanks. Thank you for such a lovely pattern. I am a beginner so it took me a while to get the lace pattern 1 right but after unpicking a few rows I finally got my head round it and it looks lovely. The sleeves were tight, as you said but not impossible and loosened up as I got higher up the garment. I am nearing the end now and I just wondered how I sew up the sleeves? I can't see any instructions on this. Perhaps I am missing something? Ups. I knitted the sleeves in flat. Is this working too? I knit the sleeves flat too! Not to worry. I'm confused. The sleeve instructions for Rows 12-15 say Work 3 rows in stockinette. Should that be Work 4 rows, or should the Rows be 12-14, which would be 3 rows. Thank you so much for all the help you are giving us to make this beautiful sweater. I'm sorry,I think I'm confused--the rows aren't numbered, so I'm not entirely sure what you're referring to here? Hi. Thanks for this lovely pattern. Quick question.... am I meant to be knitting the sleeves in the round? Or flat? Right now I have the body on a holder, one sleeve (flat) on a separate holder, and the third sleeve (flat) on my long circular needles. I'm ready to start the yoke but when you say to put the body stitches back on the needles, does that mean transfer the second sleeve to a holder? Or will the second sleeve and the body stitches both be on the needles now? Sorry of that's a super convoluted question! I knit them flat but it's totally fine to knit them in the round. Put both sets of sleeves on a holder or better yet another set of circular needles. You're in for the tricky part, and it'll be helpful to have some length of wire to use. I just CO w/Squish in the color Rose Petal. Will both the right & wrong side of the sweater have 5-sts. of Garter for the border? Repeat from * to last 2 sts, k2 " I have 1 stitch left, plus 5 sets for the border. Is my count off? Hi! It's fairly intuitive, it's just...hard. I don't know of a youtube video, but you could search bottom-up raglan cardigan. You knit to the armhole, then stretch the space of the armhole to accommodate as you knit the sleeve stitches. I do it with a fair amount of cursing. (k to 3 sts before m, ssk, k2, k2tog)2X, k to 2 sts before m, ssk, work Lace Pattern #2 between markers, k2tog, k to end. That's great!!! And it took me *forever* to learn that "Just Do It!" lesson! do a particular math equation>>> let me say, I'm not a math whiz...whats the easiest way? thanks super much, looking so sweet so far, after all the learning I will definitely have to make again in another colour! Honestly, I just spread out those decreases! I knit a while, decrease one, knit a while longer, decrease another, so that they're basically even. It doesn't have to be perfect! Why are the patterns in the book and above different?? I am at the yoke, and after so much hard work it has gone to pot as I have 6 markers when there are only 4 in the above pattern (which I am assuming is correct??) Honestly it is so frustrating. The pattern in the book does not mention leaving the markers in place when on a stitch holder and the instructions for the yoke are completely different! I don't mean to be read but I think you should have people test out ALL your patterns before you publish them as this is beyond frustrating. I'm sorry you're so frustrated. The online version is different from the book version. The version in the book took into account some of the awkward instructions in this online version (for instance including 6 st markers). If you started off with the book version, you should continue with that one, rather than switching to the online version, as they are different. However, both patterns result in basically the same sweater, it's just a slightly different approach to how you get there. The book approach is proprietary to the publisher, so I cannot print it here, but they really aren't all that different. English is not my mother languaje and even though I can speak quite well I can't understand abbreviations in knitting patterns so can anybody please tell what does it means k, yo, k2tog, s1-k1-psso, k3tog and s1-k2tog-psso??? The entire words for that, please. 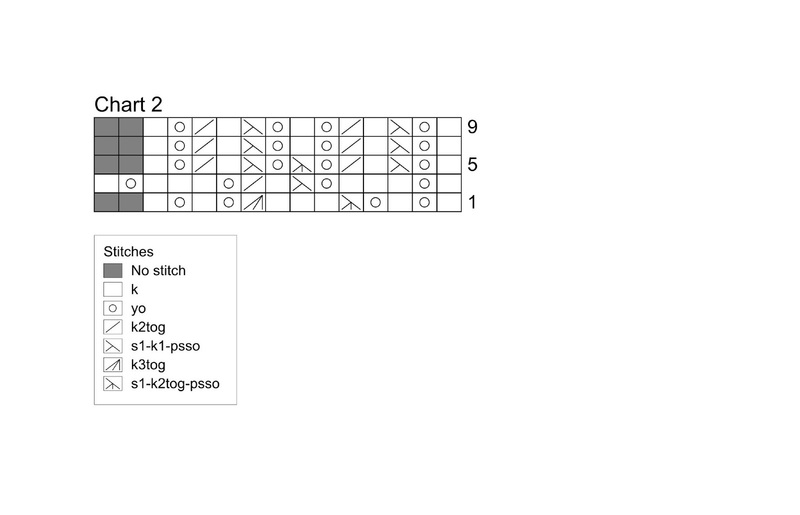 sl 1-k2tog-psso = slip one, knit two together, pass slipped stitch over. Thank you so much that helps a lot!! Hi, does this pattern come in PDF printable format? Thank you so much for creating this wonderful pattern! As my first baby sweater, it was such a fun pattern to knit! Your instructions were clear and accurate, and I couldn't be more pleased with this little garment! Thank you again and again!